Phase I construction is planned for completion before Memorial Day. Be among the few who will have family members honored with a brick paver in the flagpole area. Watch our short video below for information on our memorial. 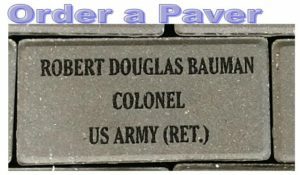 We are now accepting brick paver memorial orders! We have come a long way since we joined with Orange County to build a veterans memorial that honors the men and women who have served us in the service of their county. There have been a lot of hurdles to pass since the original concept and design for a memorial. We started fundraising in on Veterans Day 2015 and concurrently went to work on a concept design for the Homestead Site. That design was presented to Orange County Commissioners on September 20th, 2016. The commissioners and area veterans toured the site and received a presentation on the design as the commissioners looked out over the site. Our landscape design architect, David Swanson, explained that photographs were taken of the site to capture the existing historic homestead trees and then overlaid with drawings of the proposed memorial. This let everyone understand better the retained beauty of the Homestead Site. The final concept design plan was then presently formally at the Orange County Commissioners Meeting and accepted. Now the project is fully in motion and the committee can formalize project development, site dedication, fundraising, and eventually ground breaking. The site was dedicated on Veterans Day, November 11, 2016, at 11 a.m. The site construction began with groundbreaking on Memorial Day 2017 and we are finalizing construction plans for Phase I – Flag Plaza dedication for Memorial Day 2018. How can you help? Share the story of the Orange County Veterans Memorial with your family, friends, co-workers, business partners and others. Tell them that this memorial will be possible because of their efforts. This is their story, your story… it is the story of the thousands of Orange County Veterans who have defended our country since Colonial Days. Be it a dime from a child or thousands of dollars from a business, individual, trust, group, or civic organization, all donations count. Consider sponsoring or hosting a fundraising project at a school, church, or group. If you want to remember, recognize, or salute the thousands of men and women who have served their Country and Orange County, this is how you can do it. You can follow our progress by following our site news blog. Just click here or on the News Blog icon to the right. Local media coverage of our community project can be found on Our Memorial in the News page, located under News above.